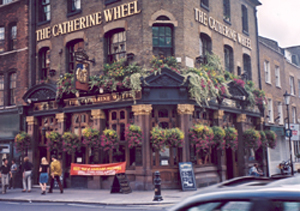 I had called Rosie Schwantes at my home college about a box of books I mailed to myself but never got, when she suddenly said, “You’re sure not writing about what most people write about when they visit London!” I suppose she meant I hadn’t reported much on famous sites. Exit the Underground at the Westminster Tube Stop, for example, and if you can manage to follow the right “Way Out” sign you emerge at the north end of Westminster Bridge. Looking right you see Big Ben with the Houses of Parliament receding westward along the River Thames. Walk just north of Parliament and a statue of Churchill stares in stolid, bull-dog defiance on the southeast corner of Parliament Square. 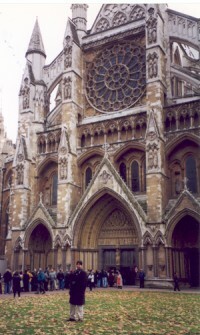 Jaunt to the left around the Square and you come to the massive east entrance of Westminster Abbey where coronations occur and famous people get buried. On the way to Canterbury and Dover the other day we passed Rochester, Dickens’ home town. He had wanted to be buried in the church there. “Too many fools in Westminster Abbey,” he had said, but that’s where Queen Victoria wanted him, and he wound up between Handel and Rudyard Kipling, either of which he may or may not have thought a fool. Stumbling on history is what London’s about. The other day a longer-than-expected Tube ride got me to a lecture at the “reconstructed” Globe Theatre late, so I just wandered the Southwark area, coming upon the Shakespeare memorial, an oddly low-profile affair—mainly some plaques and a courtyard of bricks laid down to follow the exact curve of one of the original Globe’s outer walls—but still! Shakespeare’s original Globe! I wandered into Southwark Cathedral. Much of it was obscured by scaffolding, but I experienced what I’ve experienced so many times walking into churches here. In Raymond Carver’s great story “Cathedral,” the protagonist helps a blind man “see” a cathedral by drawing it as the blind man’s hand rests on his. “That’s something,” they both say. “That’s really something.” You give a quiet whistle and say that a lot here. “That’s really something. Really something.” Stunning naves, their columns soaring, flaring into fan vaults 70 or 100 feet or more overhead, shining statuary, gilded trim—and everything soothed by the glowing intricacies of stained glass. King’s College Chapel (Cambridge) surpasses Canterbury Cathedral’s glass, surpasses London’s St. Paul’s. But Paris’ San Chapel surpasses everybody’s. Its windows, soaring nearly 100 feet each, practically are the walls, the walls’ slender stone columns seeming to disappear under the all-pervading spell of blue light. After a while your retinas start burning out. You’re amazed by Westminster Abbey’s enormity, but Saint Paul’s is bigger yet, and you can climb 200 steps to the famous “whispering gallery” circling the low end of its dome, a dome comparable to St. Peter’s. Two hundred more steps and you can step outside on a walkway circling the dome about half way up. There you get a magnificent 360-degree, normal bird’s eye view of London. (The picture here is a London sunset from this mid-dome walkway.) Two hundred more steps up to an outside walkway circling the dome near its peak and it’s an eagle-eye view. Paris’ Notre Dame is even bigger, but there’s not this dome, these walkways. Tombs and relics and memorials to death everywhere. The Eucharist enacts a pre-death meal, of course, but you’re struck here by the incessant connection between church, death, politics and war. St. Paul’s contains the tombs of Wellington and Nelson, England’s two greatest war heroes, vanquishers of Napoleonic France. Mountbatten and Lawrence of Arabia are commemorated there, as Churchill and Roosevelt are in Westminster, and side chapels and plaque upon plaque commemorate the dead of war upon war in church after church after church. In back of the high altar at St. Paul’s, a side chapel centers on a huge book containing the names of American service men and women who gave their lives for England. Tombs are hardly reserved for crypts. Tombstones make up much of the flooring in many churches, some running straight down the middle of sanctuaries. Tombs marked by large blocks of stone line the walls or circle the naves, many topped with effigies carved in elaborate dress, lying sideways propped up on an elbow, or, when they are lying flat on their backs—more usual—their hands stick up, folded piously together on their chests in an attitude of perpetual prayer. The English love their animals, and usually a dog or cat—I’ve even seen a pig—rests at the effigy’s feet, portrayed alive, watching for something. In Canterbury Cathedral one effigy lies on a thin stone supported by pillars so you can look underneath to see him lying there in the same posture, the same man, but carved naked and bone thin, a vision of what death exacts. 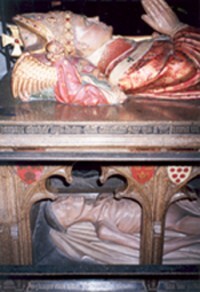 The tombs of the Black Prince, of Henry the IV and Joan of Navarre (their effigies reposed side by side) sit next to the tomb of Bishop Lancelot Andrewes. In Canterbury Cathedral a small altar table with a modernistic cross bracketed by two swords marks the spot where Thomas Beckett was martyred. Henry had made his friend first a priest, then—in the fastest track up the church hierarchy on record—an archbishop within weeks, but for the express purpose of getting him to hand the church over. Beckett, who evidently took a liking to the archbishopric, wouldn’t do it. After years of wrangling Henry said, “Who will rid me of this tempestuous priest.” Four listening knights took the King perhaps too literally, and after getting good and drunk did the deed. But for all the history, the major object of my camera has been flowers. I knew London had a reputation as a city of gardens. Still, their sheer abundance overwhelmed me. One guidebook says this of the Lime Tree Hotel in Victoria-Westminster: “Mr. Davies [the manager] is hugely competitive when it comes to winning prizes for his window boxes, and there are twice as many here as on any other house in the street. Flowers run rampant not only across the first floor, but in the basement too, and boxes hang from the front railings and second-floor balcony.” The phrase “flowers run rampant” barely captures it. Large flower pots—thick with cascading petunias, marigolds, ornamental grasses—festoon not only pubs but lamp posts, street corners, any place, really, a pot can fit. I was sorry my Linda, who loves flowers like crazy, couldn’t come until mid-October when the opulence would be beginning to fade. On the other hand, she’s the kind who gets weak-kneed at beauty, and I suppose it would have been slower going having to stop and sit down for a moment here and a moment there while she recovered from being stunned by flowers. Nearly every day I walk to Imperial College I walk down a 150 yard section of the Queen’s Flower Walk in Kensington Park. The Broad Walk, a paved path at least 20 yards wide, runs north-south through the park, but the Queen’s Flower Walk is only about six yards wide and runs along its southern border. It’s fenced knee-high on both sides with wrought iron and thickly lined with bushes and trees punctuated by beautiful beds of flowers, grasses, cabbages, even broccoli. One early November morning I saw police everywhere overseeing the set up of barricades so the Queen and assorted other royals could come to the Royal Albert Hall that Saturday for a program including Mozart’s Requiem. It was Remembrance Weekend, a time for honoring the service men and women who died in the two World Wars and later conflicts. Many people in London were wearing red cloth poppies…and reflecting on war and death…again. Read “Diversity USA,” an item in the series focusing on the 2012 London Olympics. Go to the Teaching Diversity main page. This entry was posted in Diversity & Multiculturalism and tagged Charles Dickens, Globe Theatre, Henry the IV, Imperial College, Joan of Navarre, John Harvard, Lancelot Andrewes, London, Paris, Queen's Flower Walk, Remembrance Weekend, San Chapel, Southwark Cathedral, St. Paul's Cathedral, Westminster Cathedral. Bookmark the permalink.